productions the web video specialists ..
Our walk on web video presenters are an excellent way to personalise your website and introduce your business. Our features, quality and service cannot be beat. View some of our previous work and the incredible features we offer below. 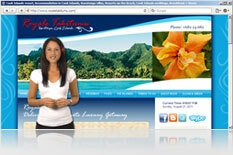 Our video banners are a great option to spice up your website but fit exactly where and how you need the video to play. There are many options including using ANY IMAGE to play the video or chain 2 videos, one after each other ... similar to this page. 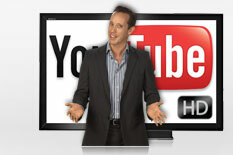 All Bell Media web videos now come with HD alternates which can be used for corporate, youtube and even TV commercials. Businesses can use these videos copied to DVDs or USB keys for meetings, seminars and conferences. BellHD videos now compatible with your iPads iPhones! Bell Media's BellHD web video products are packed full of features you won't find anywhere. We pride ourselves in offering not just the best products but the highest level of service. Please take a look at the fantastic features below & contact us today to get started on 1800 235 503 or use our free call button on the left. The Highest Quality Web Videos, using the best compression for high quality smooth playback of your web presenters for ultimate impact to the largest audience possible. Highest level of service & support! Bell Media has an ongoing working relationship with all our clients, and we are not happy until you are completely satisfied. Download Video Backups! You can download all versions of the supplied videos to burn to DVDs, or USB drives for safe keeping which are yours to do with what you please. 100% ownership! No actor royalties or restrictions on how you may use your videos e.g. hi resolution stills for signs or brochures, burn to dvd for conferences etc. Corporate HD versions for youtube, facebook, dvds, conferences, seminars etc. Example on the right, or view our facebook page or our youtube channel. Professional Quality Presenters! Our actors are professional talent and enthusiastic to represent your company to their best abilities or we will reshoot at no cost. Be in the video yourself! You can present in the video yourself so that you can add a personal youch to your web video. 12 month Free video hosting using one of the largest content delivery networks in the world! No suprise hosting bills & no need to move your existing website or upgrade your hosting plans. Compatible with all websites! Our technology is compatible with all websites including Wordpress, Joomla, and even full adobe flash websites and will not conflict with jQuery plugins. Simple installation! Our standard installs consist of copy and paste 1 line of code into your website. Many clients do it themselves. Any issues we support and install FREE! Free script assistance! We provide experienced script writing assistance to help you get your message across in a professional manner. SEO and Google friendly! Our technology will not effect your google search engine rankings. We have done numerous studies of our own aswell as external studies. See video presenter SEO speed test by one of the best in SEO Australia. Compatible with iPads and iPhones! Our BellHD web presenters are now compatible with iPads and iPhones so you wont miss any visitors using those devices. Facebook pages compatible! Bell Media is the first in the world to offer transparent web video presenters that work with facebook fan pages. See our facebook page to see it in action. Fast turn around times! Once studio, and actor are all booked in your BellHD web video product can be live on your website the next day. Total creative freedom for your BellHD video. Uniforms, multiple actors and props. Our actors can say and do whatever you would like. You can even Direct the video production. Technology built inhouse! All technology and systems are custom designed inhouse by experienced professionals that can provide flexible solutions quickly and efficiently. High Quality video that will sit next to text or sliding header/banner. See our above header example on this page. Custom designed to fit snugly inside your banner or header on your website so that it will fit seamlessly into the theme of your website. Use ANY picture / graphic to play the video which will be replaced as the start/end graphic. We will send a high quality still image from the video you can use or you may use your own. Simple to install and setup! Simply Paste the code where you would like the video to appear and position with CSS to get the exact fit if needed. We can help install at no charge. Compatible with iPads & iPhones! Bell Media video banners are fully supported on your iPhones and iPads. Visit this web page on your iPad/iPhone for example. No need for flash knowledge! Bell Media video banners are not full flash banners with a video inside. Our video banners are separate elements and able to be placed anywhere. Many more features! The BellHD video banners have many of the same features as BellHD web video presenters including fast turnaround, and free hosting etc. Bell Media has produced 1000s of BellHD website video presenters, spokespeople, & transparent walk on videos for 1000s of websites & companies since 2008. BellHD videos have been viewed by millions of people in Australia and around the world. If you would like to preview a web video presenter on your website you can do so by choosing the options below.